I am wanting to have a spa party for my 12th birthday and invite some friends over. Finger foods are best for a spa party, things like sandwiches cut into tiny squares, crackers with any kind of topping, and treats like chocolate. 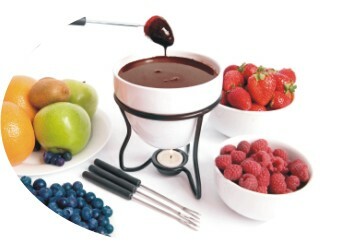 Chocolate fondue is a very classy and delicious treat that's perfect for a spa party. You can dip almost anything in the melted chocolate (things like fruit, pretzels, marshmallows, and small squares of cake). You'll also want to have some bottled water at your spa party. For an extra special touch, use our printable water bottle labels. There's even printable envelopes and invitations on my home spa party page. Besides doing facials, manicures, and pedicures, conversation games are always good. Who, Where, Why and Share are a couple of examples. If you have an older sister, aunt, or friend that is good at doing makeup or hair, ask them to come to your party and give the girls a makeover. If not, ask your friends to bring their favorite hair and makeup stuff and take turns giving each other makeovers. You'll find some great ideas for funky nail art here. Usually 4-8 girls is a good number for a spa party, but if you have enough helpers you could have more. Im having a giant spa party. This really has been a great help! I would like to know the best spa in Toronto Canada. If you have any information, please do share. I know of one spa in particular in Toronto. You can find information about the Chakra Spa here and share your experiences about spas you've been to on our best spas page. Please Note: Only ORIGINAL reviews of 250 words or more will be accepted. If we find and submitted review elsewhere online we will not post it. I'm having a spa themed party for me and my 3 close buddies at my house for my 13th birthday. I'm so excited. Me and my best best friend are having a spa party at a hotel.. and going for a boat ride first, but we don't know, what food we want to to eat so, i like the fondue idea, but i need more ideas <3 thanks but I REALLLY NEEED HEELP! You go to the spa and get nails, hair, makeup, etc. You find a pretty place. You go to the pretty place and take after pictures. i don't really know what 2 do. could you help. i need some ideas for a spa and singing party. she thinks its going 2 be boring so i kinda want to surprise her. also she want to make her friend really enjoy it. I REALLY NEED HELP!!! I threw a spa party for my little sister 2 months ago using this site. her and her friends loved it! I also recommended this site to one of my mothers friends who needed an idea for her daughters party. My little sister's friends are still talking about what an awesome party it was and how they were going to try to do the same for their party. One girl did and she used another site and my little sister said it wasn't as nice. Thanks Diva Girl Parties and Stuff for making my sisters birthday the best. You could serve juice with little umbrellas! I loooove this idea I am doing it for my 12th birthday... I had the idea a few hours before I found this site... FATE! Thank you soo much I looooove the water bottle idea and finer foods...Definitely the makeup...you are sooo clever! I am having a spa party at my house and inviting 2 other girls and I have no clue what to do meaning... food, decorations and supplies. I hope to find something before my B-day! I just had a spa party and i had chocolate strawberries. It was great. You should try it. By the way love the cool ideas. I am having a spa party and i love the ideas an definitely will do finger foods with chocolate fondue!! My friends will love the ideas! This is what i'm doing for my party. Very helpful.